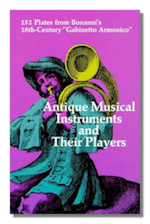 This list provides an overview of books specifically concerned with topics in "early" music. In this context, early is defined as music written before 1750, approximately. The Early Music Revival: A History. Harry Haskell. Dover Publications, Inc. 1996. ISBN 0486291626 (paperback). 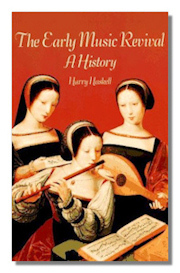 Comprehensive historical study of the early music revival, tracing its origins back to the 18th century. Issues such as Mendelssohn's rediscovery of Bach's St. Matthew Passion; influence of Schola Cantorum; period instrument builders and manufacturers; influence of such performers as Wanda Landowska, Alfred Deller, and others is explored. French Baroque Music: From Beaujoyeulx to Rameau. James R. Anthony. Amadeus Press. 1997. ISBN 1574670212 (hardcover). The vibrant era between 1581 and 1733 in France saw the development of the court ballet, the birth of the tragedie lyrique and other operatic forms, and the prodigious musical activity of such figures as Lully, Marin Marais, Delalande, Couperin, and Rameau. This was the first definitive study of French music of the Baroque era and remains the only comprehensive survey of the vast musical output of 17th- and 18th-century France. Completely revised and expanded, this new edition incorporates research of the past two decades and includes a wealth of quotations from early writers on the subject. The book provides an overview of French music of the period, exploring music of the stage and of the altar and includes chapters on music for lute, guitar, and keyboard; instrumental music; and vocal chamber music. A revised author's preface considers the present state of research in the area of French Baroque music. Finally, a new and expanded index and an updated bibliography listing more than 1,300 works make this book a superb resource for scholars as well as laymen. This widely-acclaimed volume was first published in 1974. Antique Musical Instruments and Their Players. Filippo Bonanni. Dover Publications, Inc. 1964. ISBN 0486211797 (paperback). The 1727 Il Gabinetto Armonica, a famous collection of copperplates by the Belgian engraver Arnold van Westerhout (1651-1725), shows every important instrument of the day in exceptional detail – organs, harpsichords, violins, horns, drums, etc. – plus folk instruments of Europe and the Orient. A General History of Music, from the Earliest Ages to the Present Period (1789) Volume 1. Charles Burney. Dover Publications, Inc. 1957. ISBN 0486222829 (paperback). First published in 1776, this first of four volumes was the English language history of music to be written. J.S. Bach's Musical Offering: History, Interpretation and Analysis. Hans T. David. Dover Publications, Inc. 1972. ISBN 0486227685 (paperback). "Performing Baroque Music" is a practical guide to the important issues that arise when one performs baroque music. Listeners, performers, students and teachers will find here, carefully explained and thoroughly documented, the analytical tools they need to understand and interpret musical evidence from the baroque era. Scores for eleven works, many reproduced in facsimile to illustrate the conventions of 17th and 18th century notation, are included or close study. Readers will find new material on continuo playing, as well as extensive treatment of singing and French music. The book is also a concise guide to reference materials in the field of baroque performance practice with extensive annotated bibliographies of modern and baroque sources that guide the reader toward further study. Music in Late Renaissance & Early Baroque Italy. Amadeus Press. 1992. ISBN 0713467304 (hardcover). 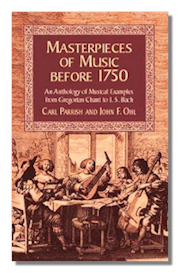 Masterpieces of Music Before 1750: An Anthology of Musical Examples from Gregorian Chant to J.S. Bach. Carl Parrish (Editor). W.W. Norton & Company. 1950 & Norton 2001. ISBN 0486418812 (paperback). 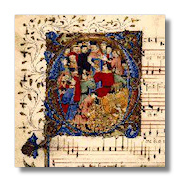 Outstanding collection of musical examples – chants, motets, chansons, madrigals, more – illustrating the general course of musical style from the early Middle Ages to the mid-18th century. Works by Lassus, Josquin des Prez, Schütz, Handel, Bach, many others. Notes identify place of composition in history of music and suggest useful methods of analysis. The Musical Dialogue; Thoughts on Monteverdi, Bach, and Mozart. Nikolaus Harnoncourt, Mary O'Neill. Amadeus Press. 1989. ISBN 093134008X (hardcover). This is a valuable collection of lectures and essays laying out Harnoncourt views on phrasing and the use of period instruments. He discusses in depth how Monteverdi, Bach, and Mozart used particular instruments and forms and relates his own experience analyzing and performing particular works. Among the topics are the various possibilities for instrumentation in Monteverdi's works, how he figured out what exactly was the oboe da caccia ("hunting oboe") called for in some of Bach's vocal works, and the performance history of the St. Matthew Passion and the Mass in B Minor and how that history has affected audience reactions to modern-day period-instrument performances of the works. Also valuable are Harnoncourt's discussions of Mozart: for example, how the meaning of tempo markings such as "allegro" and "andante" has changed from the 18th century to today, as well as the many and varied conventions of phrasing that were widely understood – and therefore were not written out in Mozart's scores and performing parts. The Italian Madrigal and Related Repertories. Harry B. Lincoln. Yale University Press. 1988. ISBN 0300036833 (hardcover). 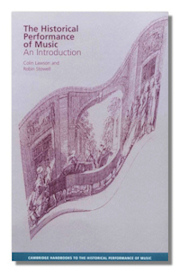 The Historical Performance of Music: An Introduction (Cambridge Handbooks to the Historical Performance of Music). Colin Lawson & Robin Stowell. Cambridge University Press. 1999. ISBN 0521621933 (hardcover), 0521627389 (paperback). This volume offers an up-to-date overview of historical performance, surveying the various current issues (such as the influence of recording) and suggesting possible future developments. Its core comprises discussion of the period performer's myriad primary source materials and their interpretation, the various aspects of style and general technique that combine to make up a well-grounded, period interpretation, and a survey of performance conditions and practices, focusing on the period c.1700-c.1900. Many of the principles outlined are illustrated in case studies of works by Bach, Mozart, Berlioz and Brahms. Medieval Instrumental Dances. Timothy J. McGee. Indiana University Press. 1989. ISBN 0253333539 (paperback). Dance and the Music of J.S. Bach. Meredith Little, Natalie Jenne. Indiana University Press. 1992. ISBN 0253335140 (hardcover). Johann Sebastian Bach devoted a significant portion of his life to the composition of stylized dance music and music based on dance rhythms. Although the music of this very special genre has long been a part of every serious musician's repertoire, very little has been written about it. Part 1 of "Dance and the Music of J.S. Bach" describes the French Court dance practices in the cities and courts in which Bach lived. It also introduces the terminology and analytical tools, rooted in the eighteenth century, that are necessary to discuss dance music with precision. Part II presents the dance forms used by Bach, annotating all of his named dances. It offers information from choreographies, harmony, theorists' writings, and the music of many seventeenth- and eighteenth-century composers in order to arrive at a model for each dance type. In Appendix I all of Bach's named dances are listed in convenient tabular form; included are the BWV number for each piece, the date of composition, the larger work in which it appears, the instrumentation, and the meter. Appendix II supplies the same data for pieces clearly recognizable as dance types but not named as such. This volume will stimulate both the musical scholar and the performer with a new look at the rhythmic lifeblood of Bach's remarkable repertoire of dance-based music.